When Memebox first released the second round of Scentboxes, I was all over the buy two get one free Value Set. The weird thing was that this time they charged shipping (last time they didn't) and we had to pay standard shipping fees for two of the boxes in the set. The description also said that there would be only 3 items in each box. Thankfully, that was not true! There are more than three items in all the boxes! 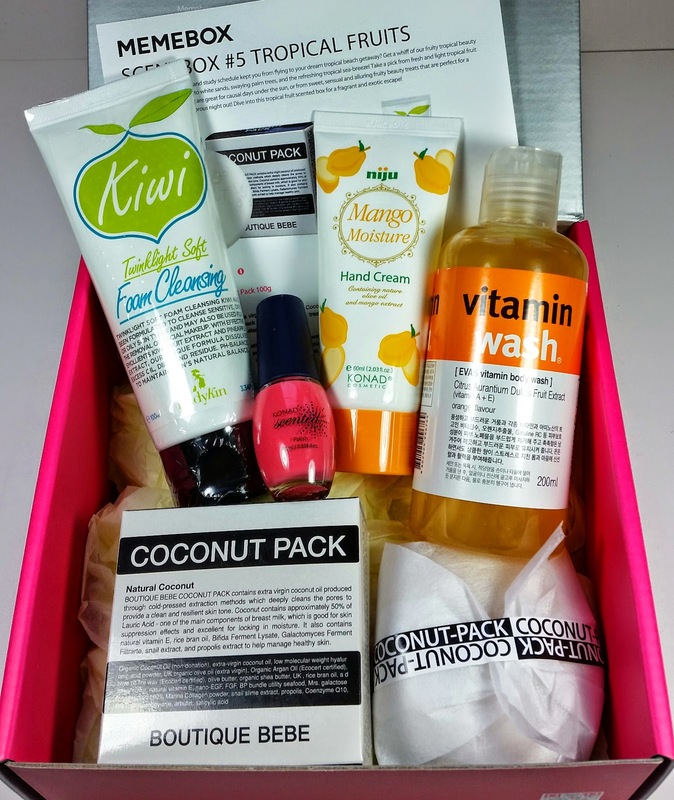 The Memebox Scentbox Tropical Fruits has FIVE items in it!! This might be the best of the three, I'm really loving the scents they chose to include. I paid $9 for this box by getting the value set and using coupons and points. So it's a great deal! 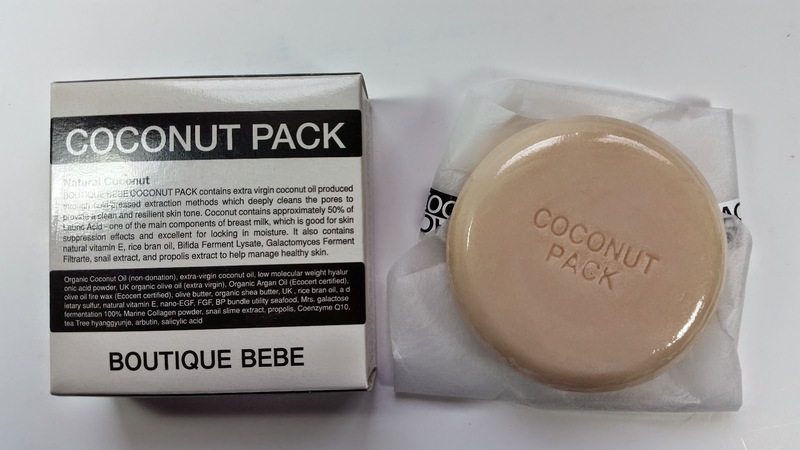 Boutique Bebe Coconut Pack- This is a face soap made entirely of all natural virgin coconut oil! It smells so unbelievably good, I want to eat it. It smells like you stuck your face in a bag of coconut shreds. It says it should be used for pore care but I think I'll just use it in the shower. I don't know if the lather is going to be super amazing because its 100% coconut. It will still clean, of course, lather is just to make you feel like you're cleaning better but it's not necessary. 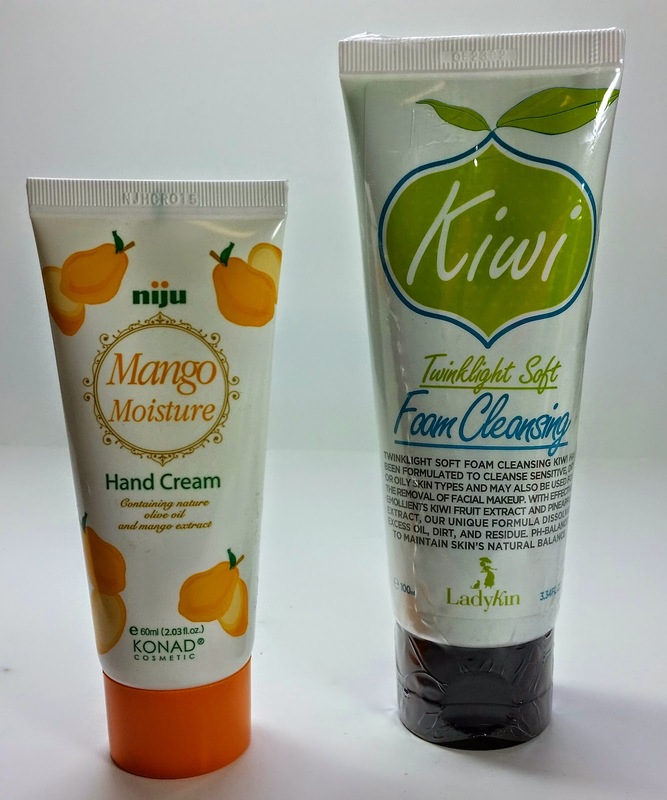 Konad Cosmetic Niju Mango Moisture Hand Cream-60ml- Enriched with shea butter, olive oil and vitamin E, this hand cream not only smells wonderful but is also highly effective at soothing, moisturizing and alleviating dry skin issues. If you're avoiding mineral oil, this does have mineral oil in it. I don't mind mineral oil but I know some people don't like it. It's also got beeswax in it which is nice for keeping the moisture in your skin. Ladykin Twinklight Soft Foam Cleanser in Kiwi-100ml- Another full size product! This is a creamy foaming cleanser that is rich in anti-oxidants and will gently cleanse your skin of impurities while nourishing and hydrating. The natural fruit extracts help remove makeup and clear out pores. It's packed with vitamin C and will help brighten and protect your skin. Ladykin is one of my new favorite brands. I have the Broccoli Toner and the Phytoplan Broccoli essence and I love them both. I'm super happy to get a cleanser in a Memebox and one that smells like Kiwi and pineapple is a total win! Konad Scented Polish-10ml- I got grapefruit and it's kind of a dusky pink color. It's pretty and I'll wear it, I'm sure. I did swatch it so I could see if it smelled like anything. It absolutely smells!! Once it dries you can really smell the grapefruit scent quite well. Fun! Plus I'm glad I didnt get orange. Heh. VERDICT: I wasn't expecting very much from the Memebox Scentboxes, especially because it said there would only be three items in each box. However, I was pleasantly surprised to see that this box had five items! At $9, this was a fun box to get. My favorite products are the LadyKin Kiwi Cleanser and then Coconut Pack soap. 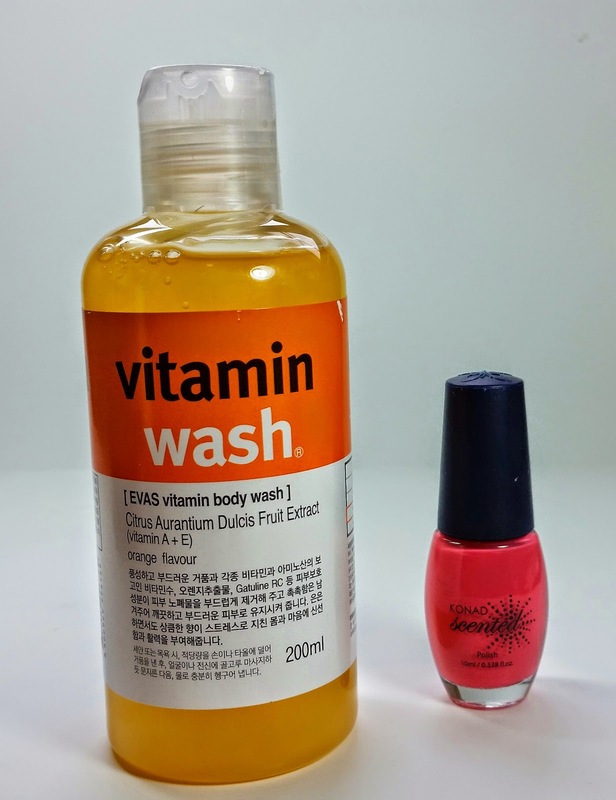 The hand cream and nail polish will be used but I haven't decided about the body wash. 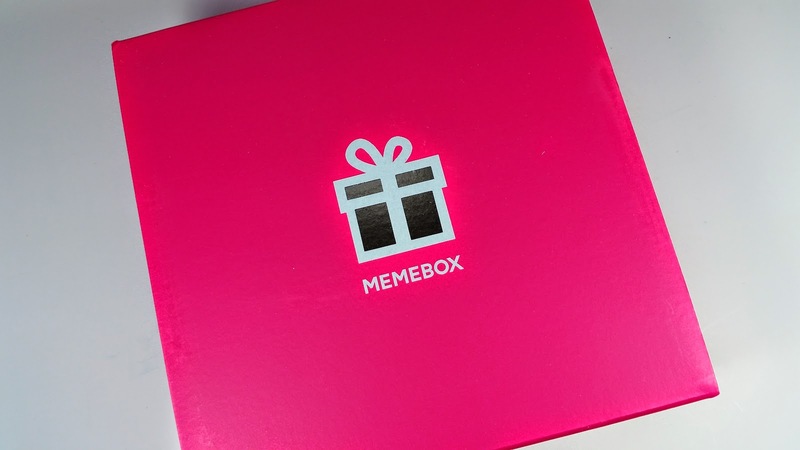 If you want to see what else Memebox has to offer, you can check out their website here. They have so many boxes to choose from! My personal current favorite is the Moisture Surge box! A spoiler came out for it and it's great! Moisturize and nourish dry and parched skin with three of ORIGINAL RAW's best hydration products! Skin will have a luminous and healthy glow that will make you look years younger! I think we really will be getting all three products in deluxe travel sizes! I want them all so I'm really excited about it. You can still buy the Moisture Surge box, too. So far it hasn't sold out but with the spoiler out it might pretty quickly. Ooh this box looks yummy! I didn't get it because I thought it'd have passion fruit in it but obviously I was wrong. Orange, grapefruit, mango, kiwi, and coconut! Love all those scents! Did you end up with the Sweet Shop one? I need to get that review up, too. The Tropical one was definitely the best. Yup! Hopefully it came in today so I have some new goodies to play with! I got the orange nail polish! It's actually not too bad - softer and more wearable than the last bright neon orange polish they sent me. I have visions of everybody in Memebox HQ wearing bright orange make up and thinking they look fantastic, they are so obsessed with that stuff. I also got the Papaya body wash which smells of precisely nothing. Even dumped a load of it in my bath and just got a lot of scentless bubbles. Possibly papayas don't smell of anything, I never sniffed one before.